In order for the grown-ups to relax and enjoy their break, it is important that there is something to entertain the children. 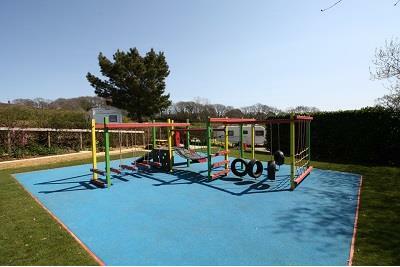 Our Play Park is one of the focal points for younger children to meet their friends and play safely in a secure environment. 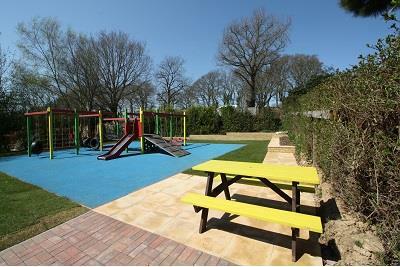 Suitable for children up to 10 years old, the Play Park is situated at the top of the touring field. Enclosed by a mature hedgerow, the access to the Play Park is limited to an entrance from the touring field. The activity frame consists of a climbing net, tyres for climbing on, a slide, a couple of different wobbly bridges, a climbing bar and a ramp. Surrounded by soft bark to provide a softer landing, children can spend ages working the way round the frame. To the side, under a small shelter is a picnic bench for parents to sit and supervise their children. Sometimes, an activity frame just isn't enough and children want to run around and kick or throw a ball. Suitable for all ages is our small, level Sports Square which is adjacent to the touring field and the horse field. Large enough to play badminton or volleyball, to kick or throw a ball around, this dedicated area provides space for the children (and grown ups!) to let off steam when the touring field is full. At the bottom of the Static Park, set on a hill, is a natural field that is used for exercising dogs or for playing games in more space. At the top of the Park, by Reception is the start of High Woods. Backing on to Kloofs, the woods are suitable for exercising the dogs or for the older children and families to explore. By following one of our walks, you are able to get to the road and cross into the main woods. The woods are not owned or managed by Kloofs, but are public woods that offers plenty of space, trees to climb, wildlife, ponds and another play park.